Another project!! This is another external brief project run by Sky Arts. We are to create a sting to advertise the channels Sky Arts 1 or 2. I finally started doing this project today and I'm happy with how far I got :3 I made an animatic!! and I did some designing on the side :3. "AAARRRTTTSSS?" 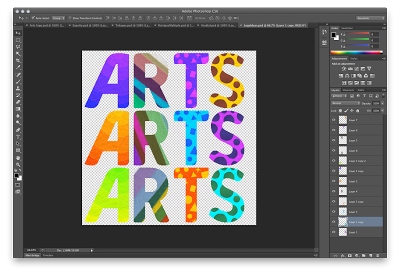 "no its Arts, three times..."
This is me trying to decide which colours each letter should have. :3 it looks pretty like that to be honest, looks abit pop arty, but I only want to use one set in the animation.